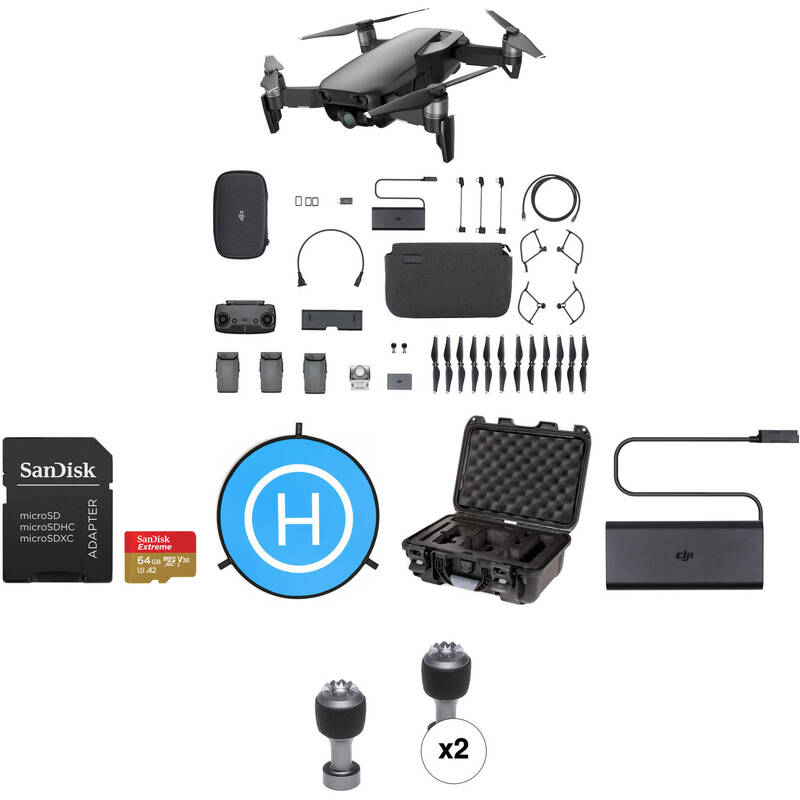 This B&H Kit consists of a DJI Mavic Air Fly More Drone with an additional 64GB microSD card and 43.3" drone landing pad, providing you with a more capable and well-rounded UAV experience right out of the box. The additional 64GB of storage gives your Mavic Air Fly More the ability to take better advantage of its 3-axis gimbal camera. Store more 12MP photos and longer 4K videos per flight. With the 43.3" landing pad you can achieve better drone functionality while protecting the drone's camera. The design gives your drone a unique indicator to memorize, which can result in more accurate landings when using the Return-to-Home function. 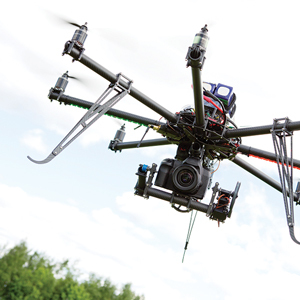 It also helps keep dust and debris from kicking up during takeoffs and landings, which could possibly damage or otherwise negatively affect the performance of the camera lens. Treat your beloved drones to a 43.3" Landing Pad from PGYTECH. Portable and easy to fold, this double-sided pad protects your drone's gimbal and camera during takeoff and landing. The landing pad comes with three pegs for securing it to the ground so it doesn't get blown away by the wind while you're up in the sky. Also included are eight reflective stripes to make landing easier in low-light situations. At the end of the day, just twist-fold the pad, slip it into the included zippered nylon pouch, and you're good to go. Protect your DJI Mavic Air drone from the elements with the Nanuk 910 Waterproof Hard Case with Insert for DJI Mavic Air Fly More Combo. This compact, hardened plastic resin case features a custom-cut foam interior with compartments for the Mavic Air itself and all the accessories that come with the Fly More Combo, excluding the DJI case, plus a smartphone for the controller. Engage the PowerClaw latches to seal the case from the elements and help protect your equipment from bumps and scuffs. The DJI Charger for Mavic Air can recharge both the battery for the Mavic Air and the remote controller via the main output. A secondary USB output is available for charging your mobile device or smartphone. This replacement charger does not include an AC cable, and requires one for connecting to mains power. The DJI Control Sticks for Mavic Air Controller quickly screw into the controller for easy replacement should one of the included control sticks breaks or gets lost. Box Dimensions (LxWxH) 15.1 x 15.0 x 1.3"
Box Dimensions (LxWxH) 16.0 x 13.0 x 7.0"
Box Dimensions (LxWxH) 4.75 x 3.5 x 1.5"
Box Dimensions (LxWxH) 6.5 x 3.5 x 0.2"
Mavic Air Fly More Drone with 64GB Card & Landing Pad Kit (Onyx Black) is rated 4.5 out of 5 by 2. 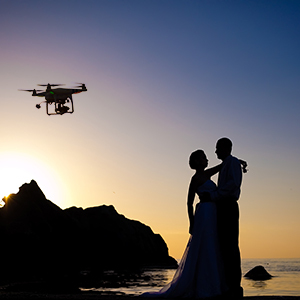 Rated 5 out of 5 by Ben F. from Simple, convenient, and predictable I've been somewhat intimidated with the idea of using a drone and had successfully avoided it for a few years. But, the inevitability of my employer asking for aerial photography finally happened and I found myself needed a tool that was simple, convenient, and predictable. I have not been disappointed. To my surprise the Mavic Air has been much easier to use than I anticipated and I now look forward to pushing it closer to its limits. I highly recommend getting the Fly More pack and landing pad. While I haven't had to change the props yet, the extra batteries are definitely a must along with the quad charger. The landing pad also makes takeoff and landing cleaner in grassy and sandy areas as well as assisting with accurate Return Home landings. Now I'm thinking of buying one for myself. Rated 4 out of 5 by Ben F. from Impressive little tool. First time flyer. I find it easy to learn and use. Video image quality is quite good. Photo quality is good, but 12MP is a bit underwhelming especially for large group photos. I'm very happy with the focus free design as it's one less thing to think about. I don't see a need for adjustable focus nor shallow depth of field for the type of photography I'm doing. Side obstacle avoidance would make it better. I greatly appreciate the compact size for portability, but I do find it difficult to see in the air once it reaches a distance of 1000 feet. Excuse , why the white one is hundred dollars chipper than the other two ?